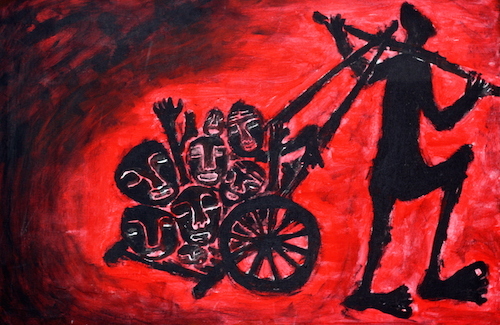 Author and literary theorist Sharankumar Limbale (Towards an Aesthetic of Dalit Literature: History, Controversies and Considerations, 2004) defined Dalit literature as that which “artistically portrays the sorrows, tribulations, slavery, degradation, ridicule and poverty endured by Dalits [p 30]”. He went on to say that the defining feature of Dalit literature is that it is written by Dalits about Dalits, with Dalit consciousness based on Babasaheb Ambedkar’s thought. In the 20th century, many of India’s literary fields, including Marathi, Tamil, English and Hindi, have been influenced by Dalit consciousness. Hindi Dalit Literature and the Politics of Representation, by Sarah Beth Hunt, a scholar in postcolonial South Asian literature, is a critical discussion of the emergence of Dalit literature in Hindi literary field. Because of the author’s interdisciplinary approach, her work is as much about literature as about politics and identity. Hunt deals with a wide range of issues – the role of Dalit literature in constructing identity, politics of representation and social change, and the interplay between literature and politics. Many other scholars, too, have shown that the emergence of Ambedkar on the larger scene of Indian politics in the 1920s had a tremendous impact on literature. Under Ambedkar’s influence, many Dalit writers took to writing as a mission to spread awareness among untouchables and lower castes. According to Limbale (2004), the period from Ambedkar’s arrival (1920) to his conversion to Buddhism (1956) marked a renaissance in Dalit literature. Similarly, the eminent historian Eleanor Zelliot (“Dalit Sahitya: The Historical Background” in Mulk Raj Anand and Eleanor Zelliot eds, An Anthology of Dalit Literature, 1992) found Dalit literature to have had a longer history, tracing its link to the Mahar Movement and the aims of Ambedkar and his conversion to Buddhism. Hunt, too, has corroborated her hypothesis with examples of works of early Dalit literature. The first two chapters of the book are devoted to surveying and analyzing Dalit pamphlets of the early 20th century in Uttar Pradesh. Excluded from the Hindi public sphere, some Dalits set up their own press. One such enthusiast was Chandrikaprasad Jigyasu. Born into a Bahujan family in Lucknow in 1899, Jigyasu established Kalyan Prakashan in the 1930s. Earlier, he had propagated nationalist ideas through his writings but had become disillusioned with the mainstream nationalist movement for glossing over the issue of social reforms. Later, he came in contact with Achutanand of the Adi Hindu Movement and Ambedkar, and changed the name of his press from Hindu Samaj Sudhar Karyalay to Bahujan Kalyan Prakashan. The shift in Jigyasu’s thinking was similar to the change in approach among many Dalit writers of the early 20th century, when they began to denounce Hinduism completely. The Bahujan writers, therefore, used “pamphlet fields as an arena of social activism” and created a “counter-public” sphere in the 1920s. Their target of attack was Hinduism and their multifaceted themes revolved around issues concerning caste, untouchability, Dalit history and discrimination. Analyzing the contents, Hunt showed that much of Dalit pamphlets of the later period portrayed Dalits as the descendents of original inhabitants of India and upper castes as “foreign invaders” with Aryan ancestors. In other words, these pamphlets deployed the trope of “indigeneity” and constructed the pre-Aryan period as “the Golden Age”. Moreover, these writings also dismissed Aryans as “dishonest”, “capricious”, “treacherous”, “violent” and “aggressive”, and blamed them for injustice, misrule and severe oppression. Some pamphlets, on the other hand, contrasted the “unjust” Ramrajya with the “Golden age” of King Bali. As one can see here, it is one of important strategies of Dalit writers to deconstruct brahmanical myths and demolish their revered icons, while retelling the myth from a subaltern perspective. The author has moved on from pamphlets to autobiographies in the third and fourth chapters. The emergence of autobiographies in Hindi Dalit literature in the 1980s was influenced by Marathi Dalit writings. The autobiographies of Omprakash Valmiki (Juthan), Mohandas Naimisharay (Apne Apne Pinjare) and Surajpal Chauhan (Tiraskrit) stirred the calm waters of Hindi literature. In these autobiographies, Dalit writers asserted their struggles and sufferings and wrote about their poverty and discrimination. In her analysis of Dalit autobiography, Hunt pointed out that unlike the portrayal of Dalit characters as helpless and socially inferior in mainstream literature, Hindi Dalit writers presented them as assertive, strong and skilful. This is linked to the controversy around Premchand’s representation of Dalit characters. While the progressive writer Premchand was among the first to write about Dalits, his portrayal of two Dalit characters, father Ghisu and son Madhav, in his short story Kafan, drew flak from many Dalit writers. In Kafan, Ghisu and Madhav are busy fighting over who will have the last remnant of potatoes at a time when Madhav’s wife is dying at childbirth. What irked Dalit writers more was Premchand’s depiction of both father and son spending the money earmarked for the kafan (shroud) on their meals. Criticizing Premchand for showing Ghisu and Madhav to be involved in such “inhuman activities”, Dalit writers broadly argued that an upper-caste writer, such as Premchand, had an inherent limitation in expressing the “authentic” experience of Dalits. In his criticism of Premchand, noted Dalit writer Kanwal Bharti argued that Premchand was not a Dalit and saw the Dalit problem from a distance (p 238). But Professor Veer Bharat Talwar of Jawaharlal Nehru University and noted writer Ramnika Gupta came out in defence of Premchand saying that his novel Godan does recognize the agency of Dalit characters when a gang of Chamars push a cow’s bone into a pandit’s mouth for impregnating a Dalit girl (p 239). Controversies such as the one on Premchand were part of the larger debate in Hindi literature about “who can write about Dalits?”. The debate was Svanubhuti (self-perception) versus Sahanubhuti (sympathy). The supporters of the Sahanubhuti school broadly asserted that being born a Dalit cannot be a precondition for writing about Dalits and any non-Dalit writer who has a “broader experience” and “power of imagination” can write about Dalit issues. But the advocates of the Svanubhuti school contended that non-Dalit writers often distorted Dalit experiences and painted them as being “repulsive”. They also doubted the intention of upper-caste writers by raising questions such as “why were not savarna writers earlier writing about Dalit life?”. If one is interested in learning more about what is happening in Hindi Dalit literature, this book is a must. Hunt’s work is not only useful for the students of Hindi literature but also for the researchers and general readers interested in literature, politics and history of South Asia.